At the beginning of this year, the plummeting-elevator thrill ride called Tower of Terror closed its Twilight Zone-themed doors at Disney’s California Adventure in Anaheim for the final haunting time. 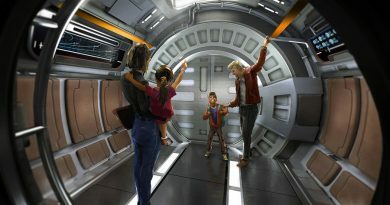 In late May the ride reopened as Guardians of the Galaxy – Mission: BREAKOUT!, the first installment toward giving the Marvel Cinematic Universe its own themed area across the promenade from Disneyland’s upcoming Star Wars: Galaxy’s Edge frontier outpost. 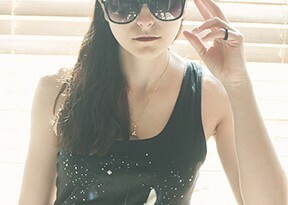 Earlier this month FANgirl finally had an opportunity to check out the new ride. While the physical layout of the ride and the mechanics of its vertical thrills remain familiar to guests who rode the previous iteration, the reskinning successfully accomplished a complete reinvention – and improvement – of the ride experience. Mission: BREAKOUT! adds more story and randomization to make repeat rides far more fun to experience. On the outside, the building housing the ride has not altered its basic shape, but its exterior appearance has changed remarkably. Instead of the drab monochrome color of the lightning-struck Hollywood Tower Hotel, the Collector’s fortress is a brilliant multi-color spectacle as odd as Tanileer Tivan himself. The outdoor queue area likewise has transformed from a 1930s hotel grounds to a science-fiction tourist destination. Reaching the main doors, guests enter the interior queue room. Spider webs and worn-down accoutrements emblematic of a haunted hotel adrift in the warped space-time of the Twilight Zone have been replaced with sparkling sci-fi display cases. 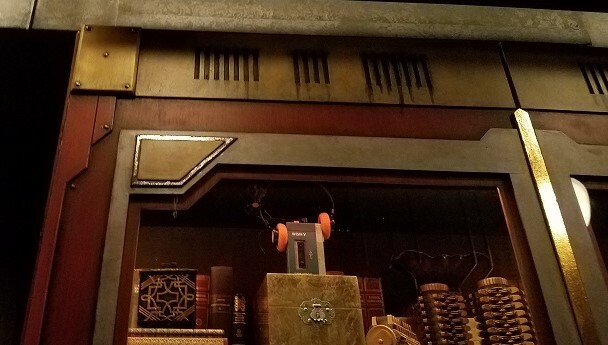 While a video plays welcoming guests to tour the Tivan Collection, the queue ambles past a variety of items from across the Marvel Cinematic Universe. 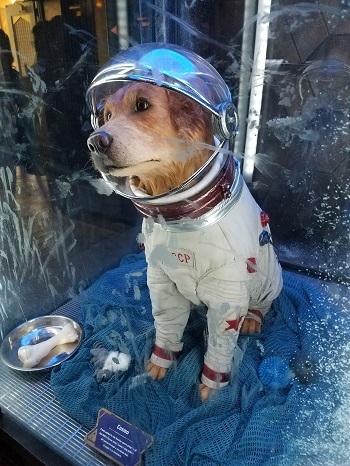 During our visit, the collection included Cosmo the Space Dog, a partial Ultron robot, Kree weapons, and the Warlock’s Eye. Small groups of guests then move along into a smaller room to watch a video explaining the ride. The former hotel library has become an overflow storage room in the collection, with numerous smaller objects and artifacts throughout the room’s shelves and walls. The video begins with Tanileer Tivan’s introduction of his collection and its newest prized addition – the five captured members of the Guardians of the Galaxy crew – before Rocket interrupts the feed to explain his own escape from confinement and plan to free his trapped friends. Here the Imagineers also made creative use of one of the ride tropes – passengers raising their hands in the air while the ride vehicle plummets downward – as part of the story itself. Hand scans are a component of the Collector’s security within his fortress and Rocket’s hands would be identified as an escaped collectible, so he needs the tour members’ hand scans to give him access to the areas of the fortress he’ll need to reach to undertake the breakout. 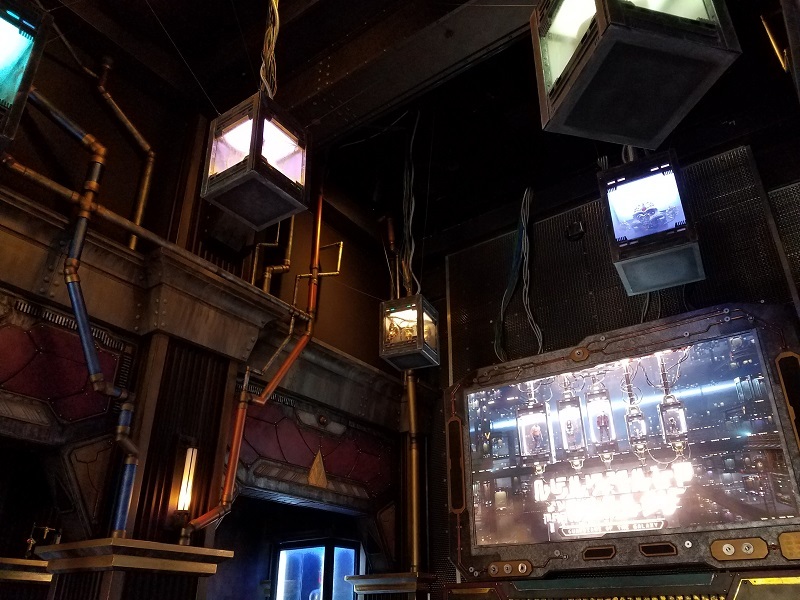 As Rocket’s narration ends, keep a close eye on one of the glass cases along the wall: you’ll see Peter Quill’s Walkman and Rocket’s hand reach down to snag it for his friend. The last stage of the ride queue continues the idea of behind-the-scenes storage areas within the collection. Instead of the former boiler room leading to maintenance service elevators, guests walk through a variety of other items – including the original Abominable Snowman from the Matterhorn Bobsleds – before being sorted into ride groups. While waiting for the gantry lifts to take them to view the captive Guardians among the Tivan Collection, guests must raise their hands into the air for scanning to confirm their identities as valid participants in the tour. Once seated in the gantry lift, the ride experience begins. As promised, Rocket cuts off the power to facilitate the rescue, causing the lifts to malfunction and create the rising and falling vertical ride. At several times the lift doors open, revealing video sequences of the Guardians dealing with various challenges impeding their exit. Although it can be difficult to hear over the music and the screaming occupants of the gantry lift, Rocket provides additional narration during the ride itself. If the doors open to reveal the park outside, listen closely and you might hear Rocket exclaim, “Is that Disneyland? 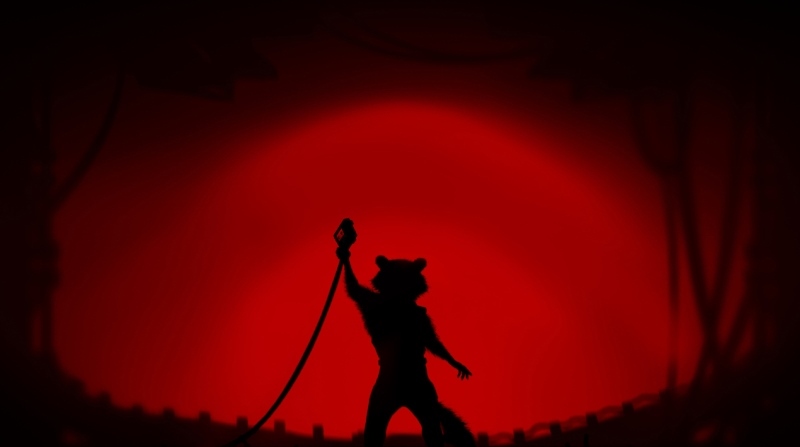 That’s so cool!” In the final video, showing the Guardians making their successful escape, Quill holds the Walkman and thanks Rocket for retrieving it. Currently the ride has a six-track playlist, with each song accompanying a different ride profile. Which track will play during the ride is randomized, making each experience unpredictable in advance. 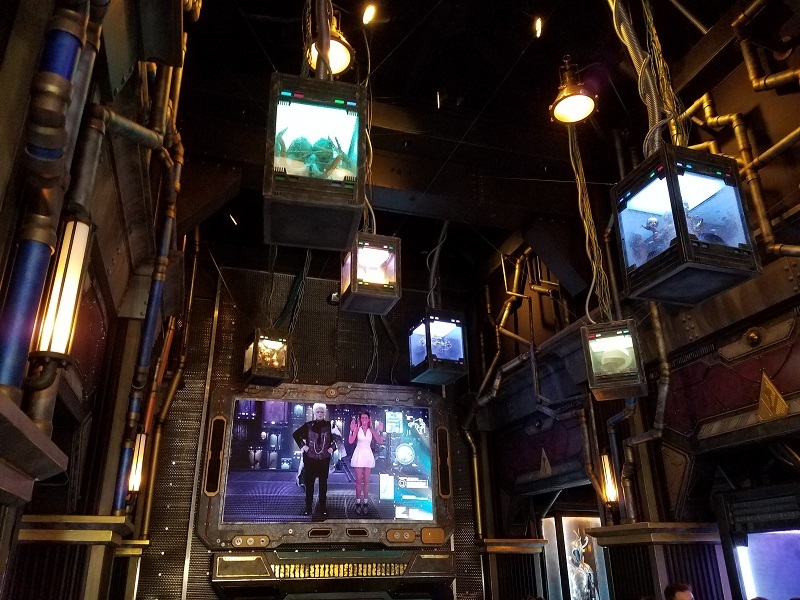 We rode Mission: BREAKOUT! three times, and had a different song each time. (From September 15 to October 31 during Disneyland’s Halloween themed park overlays, the ride has a seventh profile, Monsters After Dark, that runs exclusively during the evening hours before California Adventure closes.) It may not have as many permutations as Star Tours, but Mission: BREAKOUT! 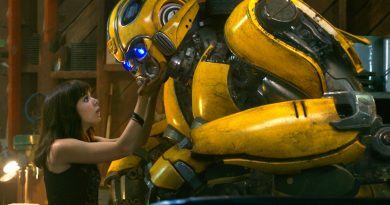 has high repeat value and rollicking soundtrack that stacks up well to Aerosmith’s tunes in Rockin’ Roller Coaster. In mid-August Epcot’s Universe of Energy pavilion closed permanently, with construction already underway on a new Guardians of the Galaxy roller coaster in the same location. When completed, Walt Disney World will have its own Guardians ride to offer. In addition, the Tower of Terror at Disney’s Hollywood Studios in Orlando retains the Twilight Zone theme, and it seems likely to continue as such for the foreseeable future. In the meantime, Mission: BREAKOUT! is definitely a ride we’re looking forward to riding again. 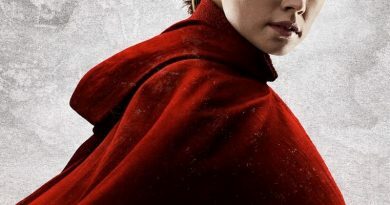 This Is Why Year of the Fangirl Is Awesome – Today is Kay Day!